February 2016, Houston TX – Troy Escamilla and Renee K. Smith, in collaboration with Fright Meter Films, are set to produce their first ever feature film and bring true terror to the screen in Fall 2016. Titled Party Night and penned by Escamilla, the film is a throwback to 80’s slasher films such as Prom Night and Hell Night. This is the first feature film produced by Fright Meter Films, and the passion for this project is immense. “This film is truly a love letter to fans of genre. There are many references in the script that horror fans will grin widely at, but the film is still unique in its own right,” Escamilla states. Escamilla has a goal of raising $10,500 by March 10th, 2016 with the Party Night campaign. Troy Escamilla knows the horror genre. He founded the Fright Meter Awards, which have grown in respect and popularity over the last few years with global backers that make up the over 50 member international Award Committee, including bloggers, writers, directors, producers, actors and fans in the horror genre. 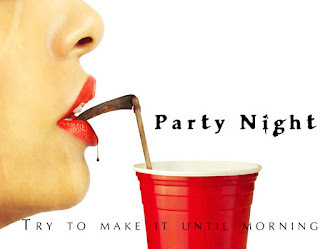 What makes Party Night the perfect first project for Fright Meter Films is that it is fairly simplistic in its structure and content: there are only seven characters in the script and 85% of it takes place at one location, which equates to a modest budget. Collaborations are happening with other independent filmmakers, such as Kevin Sommerfield, who wrote and produced both Don't Go to the Reunion and Dismembering Christmas. Sommerfeld is on board as producer to lend his expertise on low budget independent filmmaking. Renee K. Smith, has experience as a playwright, producer, and director in the Houston area. The teaser trailer for the film can be viewed on the Kickstarter page via the link below. Remember: Kickstarter Campaigns are all or nothing. • Pledge now. There are great rewards for backers! Big or small, all pledges are welcomed and all count! Every amount helps us hit the front Kickstarter page! Remember: the money is not contributed now—It will not be paid until the campaign ends! • Visit the Kickstarter page even if you can’t pledge. All views help boost our notice! • If you know someone who could be a "significant giver” and is a fan of the arts and/or horror, tell them about the film and ask them to pledge at Kickstarter. • Let others know—forward this information and invite them to help.